Let people drink your overpriced coffee. Now take your money and go home. When you’re white, male, and super-rich, you must think that the rest of the world owes you their attention. 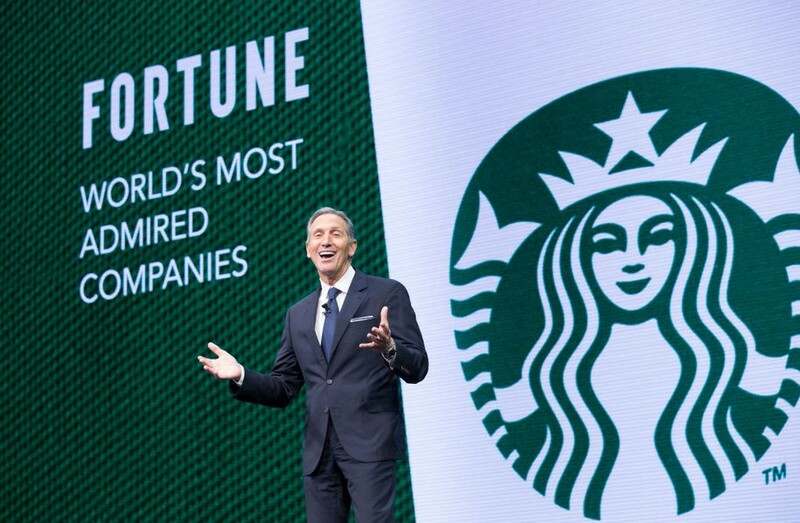 And too many in the media (many also white, male, and wealthy, if not super-rich) are treating the teases from former Starbucks CEO Howard Schultz about running as an independent as the most important story in the 2020 presidential race. Note to media: Didn’t you learn anything from your mistakes in 2016? That’s how we ended up with Donald Trump. Schultz is all over the airwaves with his pronouncements, from 60 Minutes to The View to NPR’s Morning Edition to a slew of morning shows. He doesn’t offer specifics about any policies. When it comes down to it, he just doesn’t want to pay any more in taxes, so he trashes all Democratic plans suggesting that idea. He thinks that gives him a “centrist” platform that will appeal to independents, saying that politics in America is “broken,” yada yada yada..
Maybe this is just a big ego trip for Schultz. Maybe it’s all about hyping sales for his new memoir, From the Ground Up. Maybe this is all a trial balloon that is soon going to pop. But we got the same “trial balloon” assurances about Trump in 2015. Schultz says he’s a “lifelong Democrat” and has contributed thousands of dollars to Democratic candidate. (Of course, being a “lifelong Democrat” doesn’t mean he always bothered to vote.) Democrats are understandably furious that he might siphon enough votes away from a Democratic nominee to deliver a second Trump term. A new internal poll done by Schultz’ own people showed him drawing 17 percent support (highly unlikely) and tipping the election to Trump. Many moderate current or former members of Congress — from both parties — also are giving the idea of a Schultz candidacy a big thumbs-down. Schultz repeats the centrist pablum that “both parties are broken” and that voters want more choices. A Politico story on Schultz destroys that argument. Schultz is hardly the first to want to use his wealth to run for office. So if he is really interested, let him do what others have done: Develop a platform and run in primary contests. One fair metric is how have other billionaires have performed in public office. There are many examples of awful governance, such as Trump and Florida’s Rick Scott. Others, such as New York’s Michael Bloomberg and other wealthy leaders over the course of American history, have done better. But most of them at least started out in some form of public service. Rauner made a fortune in a private equity firm before he switched to politics. He eked out a win in 2014 in a bad year for Democrats. He had never sought public office before, and it quickly became clear that he didn’t know what he was doing. Illinois didn’t have a budget for more than two years because he had no idea how to deal with the Democratic majority in the Illinois Legislature (which has its own issues, but we won’t dwell on those here). He, like Schultz, claimed he was socially moderate and fiscally conservative. Rauner was a complete failure as governor. It’s way too early in the game to judge Pritzker as the state’s chief executive — also his first elected office. But at least he’s been involved in politics before. In college, he served as a congressional aide to a California congressman. He worked on political campaigns and served on the staff of Illinois Sen. Alan Dixon. His foundation focuses on early childhood health, nutrition, and education initiatives. With his wealth, he has formed political alliances with Democrats through campaign donations. During his campaign, he also formed alliances with several unions that backed him. Although some campaign positions were short on specifics, he backs action on progressive issues that matter such as climate change, gun violence, and more. He was very clear about backing a progressive income tax for the state — a tax in which he would pay more, not less. People enter politics and public service from all walks of life, and with a wide variety of experience. There’s no rule that a successful CEO can’t run for office, and he or she doesn’t necessarily have to choose one of the major political parties. But just because Schultz made a fortune with his Starbucks franchises doesn’t mean he’s qualified to be commander in chief. Or formulate foreign policy. Or oversee the executive branch of the government. Schultz already has hired some top talent for his possible team. Republican Steve Schmidt, a GOP strategist who worked on John McCain’s 2008 campaign, became a “never Trumper” and an analyst for MSNBC. On the other side, Bill Burton, who worked on President Obama’s 2008 campaign and went on to serve as Obama’s deputy press secretary, also is on board. Talk about strange bedfellows. Schmidt already had become an outsider to Republicans because of his Trump criticism and his MSNBC job. Burton is now drawing the vitriol of Democrats. Interestingly, in the 2016 contest, Burton often warned against voting for a third-party candidate, lest that throw the race to Trump. Good luck getting work in politics after this gig, guys. Maybe this whole thing is just a ploy to make sure that tax rates for rich people don’t go up. Declared candidate Sen. Elizabeth Warren has been very clear in her plan to tax the super-rich. Freshman Rep. Alexandra Ocasio-Cortez has suggested raising the tax rate as high as 70 percent on income over $10 million, all to fund the Green New Deal. Raising taxes on the wealthy is turning out to be a popular idea as well — a Fox News poll says 85 percent of Democrats and 54 percent of Republicans want to raise taxes on those making over $10 million. That’s probably the most likely reason for Schultz’s ego-filled crusade — keeping his money. Third-party candidates who run for president don’t win. Schultz would probably do better to take Washington Post columnist Alexandra Petri’s advice to go to space. Going to space will satisfy the primary urge that motivates runs for president: the desire to spend vast amounts of money on something not useful. But, unlike running for president, it combines all the fun of wasting money on something not immediately helpful to anyone with all the fun of not accidentally contributing to a second term for Donald Trump! Schultz has said it is time to rise above the party system. Well, how better to rise above the party system than to climb aboard a spaceship and hover at least 62 miles above the Earth, probably even farther? ← More and more Americans believe in #ClimateChange. When will lawmakers catch up?